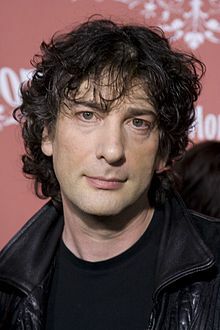 Neil Richard MacKinnon Gaiman (/ˈɡeɪmən/; born Neil Richard Gaiman; 10 November 1960) is an English author of short fiction, novels, comic books, graphic novels, audio theatre and movies. His known works include the comic book series The Sandman and novels Stardust, American Gods, Coraline, and The Graveyard Book. He has won many awards, including the Hugo, Nebula, and Bram Stoker awards, as well as the Newbery and Carnegie medals. He is the first author to win both the Newbery and the Carnegie medals for the same work, The Graveyard Book (2008). Gaiman is married to Amanda Palmer. He lives in Wisconsin and Cambridge, Massachusetts. He has a son and two daughters by his ex-wife. ↑ "Neil Gaiman". Saturday Live. ↑ Miller, John Jackson (June 10, 2005). "Comics Industry Birthdays". Comics Buyer's Guide. Archived from the original on October 29, 2010. ↑ Press Association (26 December 2013). "Neil Gaiman novel wins Book of the Year". The Guardian. Retrieved 27 December 2013. This page was last changed on 1 November 2018, at 18:43.